Chapter 1: "Edge of Anarchy"
This volume of Pathfinder includes a GM’s gazetteer of the city of Korvosa, designed to supplement the player-oriented Pathfinder Chronicles Guide to Korvosa, along with a presentation on the mystical culture of the land’s indigenous Varisians and several new monsters designed for use in urban environs. Your new campaign starts right here! For characters of 1st to 4th level. I ran this for six players, using the re-released version for Pathfinder. I've always heard great things about Curse of the Crimson Throne. However, the fact that my 3.5 experience was limited to only a couple of adventures as a player was somewhat of a deterrent. Since converting the whole thing wasn't something I really wanted to do, this adventure path got put in the backlog of things I might run some day. So, naturally I was thrilled when they announced that they were re-releasing the whole campaign for Pathfinder. Curse of the Crimson Throne immediately came out of the backlog and jumped right up to the top of the list of things I wanted to run. and having completed the first installment, I feel that the adventure mostly lives up to the hype. The setting and feel of the campaign is very well executed. Korvosa as a city falls into a lot of the tropes of your typical rpg city. Wealthy districts contain cavorting nobles and political schemers. The poor districts contain slums where crime runs rampant. While this is perhaps not the most original setting in the world, it's familiarity was useful. I liked that my players were able to make assumptions about the setting and quickly become immersed in the game world as a result. Once, they were comfortable in the world, the game introduces the king's death and the resulting riots, shifting the setting into something more unique. The writers very cleverly created a world that would be immersive and interesting, without requiring a whole lot of exposition to do so. I also liked the way that NPCs were used in this game. Despite, the somewhat spoilery nature of the adventure path's title, my players did not immediately lock on to the queen being evil. Her initial portrayal as someone who is thrust into a position of power and way over their head makes it believable that her decisions are the result of fear and incompetence, instead of some nefarious plot. Cressida also served her purpose very well. Often I find that her type of NPC can seem a bit useless to the players, since they are always looking to the party to solve all their problems. However, between the obvious chaos and her careful, insightful commentary of the troubles facing the city, she came off as a competent commander who was just strapped for resources and dealt terrible hand. As a result, the players quickly viewed her as the trusted ally she is intended to be. Other characters also provided good roleplaying opportunities. Trinia, the scapegoat for the king's murder, works well as an introduction to the greater conspiracy and corruption in the city. Vencarlo was also a fun addition, even if he is not the most original character. Given his greater involvement in later chapters, I think it was smart to get the PCs acquainted with him early on. I am also a fan of the chase mechanics that were used in a part of the book. I know that a lot of the special rules introduced in the various adventure paths can be a bit cumbersome and reduce things to dice rolls that could have been better handled by good RP. However, Pathfinder's chase mechanics are relatively simple to learn and I felt they encouraged my players to be more creative by forcing them out of the standard "move and attack" pattern. One potential pitfall with this adventure is that the information provided in the player's guide and the initial mission could set the wrong expectations for the rest of the campaign. The initial set up for the adventure is the PCs working to bring justice to a crime lord named Gaedran Lamm who has wronged each of them in some significant way. Without additional guidance, this could lead to players building characters whose primary motivation is revenge. That could be both disappointing, when Gaedren is dealt with very quickly, and problematic, because the rest of the game relies on the PCs being motivated to help the city, often for little or no payment. However, this issue can be avoided entirely by good communication during character creation. For my game I required all my PCs to either be good aligned or have a reason why they would be personally invested in helping the city during a crisis. The only other issue I had with this book was the overall flow. After dealing with Gaedran Lamm in Part 1, the rest of the book is just a string of missions that Cressida asks the party to do. While these missions are individually fun and do a good job of introducing the players to life in Korvosa, they have little to do with one another beyond having the riots as a root cause. Also, with the exception of the mission to catch Trinia, they have very little relevance to the overall story. Even the final part of the book didn't feel very final. My players searched the entire dungeon for Rolth Lamm, because they didn't realize that the random Derro lackey they fought was supposed to be the final boss. Essentially, this book is mostly set up for future installments and doesn't tell much of a story in its own right. Classic adventure made only more challenging with the updates! I've played through two attempts to complete part one of Curse of the Crimson Throne and both times, the Edge of Anarchy has battered the players into submission. It's a very fun beginning to the adventure path, and while it may have been nice to keep playing through to the end, the parts we managed to play were quite memorable. This one is definitely a classic. Play it when you get the chance and do your best to keep Korvosa from tumbling into anarchy. It's not as easy as one may think! Crimson throne curse, I think is a novel idea to start a AP. Sets up a different tone than usual. With the back drop of an ambitious queen to boot makes for a nice stirring of city intrigue. The Harrow deck also helps to incorporate more flavor to the recipe of the series. The owner can do readings in a spectral manner is a nice touch. The possible rioting and chase of a blamed king-killer, last minute saving by a local folk hero helps to pull the players into the plot of things to come. Regicide or not this AP starts off with a attention grabber and keeps one riding along for a thrill. I wasn't sold on this adventure until I ran it, but now, looking back at it? It was totally awesome. First and foremost, the best part of this adventure is that it sets up a number of situations for your PCs to go in to, but it doesn't contain any expectations on HOW those situations will be dealt with, or what the CONSEQUENCES will be. Early on, you have to deal with an orphanage run by a horrible man. But do you have to fight your way in? Could you sneak in? Do you bargain with the minions? It's all up to your players. And what's more, when the orphanage falls, what happens to the kids? Again, all up to your players. And that's what really shines about this adventure, your players are really put in the driver's seat and what happens is all to do with what THEY want to do. Maybe they want to roleplay a fast-talking rogue who gets them through the situation? Or a magician who uses illusions to intimidate foes? Or a warrior who just kicks in the door? All acceptable solutions to the many problems contained herein. Now, that said? DM's are going to have to do some work to really get this thing to shine. (One thing FOR SURE is you're going to want to make Trinia Sabor 5th level) It's on you to develop the characters and really create this city called Korvosa. But, the more you put in, the more the place just comes to life. Eel's End becomes a dark 'Las Vegas' kind of place with all kinds of characters. The people of the Shingles can be revealed as humble artisans and caring citizens and optimistic youths. And the orphans rescued from the evil Mr. Lamm can turn out to be the best, most affectionate side-kicks the PCs ever had. But, again, that's what's great about this adventure, it's on you. It would be impossible for the authors to put in all the details and nuances needed, so you'll have to roll up your sleeves and get creative, but you will be well rewarded for doing so. In summation, this is a great adventure, because it's on you. It sets up a solid framework with a good story, but it puts you and your players in the driver's seat. In this DM's opinion, this is BETTER than the continuation, Seven Days to the Grave. Short Version: This adventure is too linear, but has aged surprisingly well. I'd definitely still run this adventure, although I'm a little concerned about the amount of adjustments needed. The early sections feel like they need a little more meat, both foreshadowing future occurrences and grounding the players in Korvosa. The latter parts should probably be loosened up a bit, structure wise. Even with that work, and the lesser concern of conversion from 3.5, this still seems like a fun adventure. I'm looking forward to getting the rest of the Curse of the Crimson Throne. Posted more thoughts on tumblr. Is the all-in-one PDF missing the Prologue page? My copy has page 6 immediately following the Table of Contents, but the TOC says the prologue should be on page 4. What happened to the PDF files sizes? I have plenty of disk space, but the CotCT pdfs are 4 times the size of the RotRL ones. Is the art that much better? Kudos on the "Visit Beautiful Kordosa" ad. Srsly awesome. 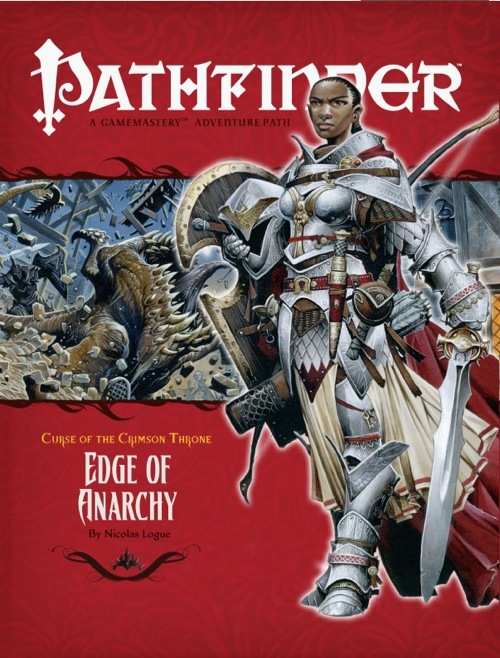 We have updated the PDF of Pathfinder #7—Curse of the Crimson Throne Chapter 1: "Edge of Anarchy." The Foreword now appears in the single-file download, file sizes have been greatly optimized, and bookmarks have been improved. Thanks! I always appreciate feedback on our marketing efforts. This month's Pathfinder's Journal was awesome. A really good in-world look at a barbarian's rage and fast movement. Has it been shipped yet? Mainly cause I just got my sunscription 2 weeks ago and was wondering if and when this would ship with it. Mine appears to be in the process of being fired by trebuchet at a passing UPS truck. Oh, wait, that was just copies of the WotC press releases about the GSL being available soon, and the UPS guy was just being used as a rangefinder... My stuff was already en route via a less violent method. This is awesome, no better than awesome, it's like a squirrel salad sammich with pimentos! Are you going to post the prospective levels each adventure will span for the new story arch as you did for "Rise of the Runelords?" At what level does Curse of the Crimson Throne start? I was just wondering how the three different series fit together and if the party has to start over at the beginning of each adventure path. Do they all get tied together at the end? All three start at level 1. It's tough to run three consecutive 15+ level campaigns, as the final path would be a party of gods fighting other gods. So far the first two paths tie together in that they both take place in Varisia, and there are a few Easter eggs that parties going through them in order will notice. Other than that, you could add in some common NPCs who have traveled to Korvosa, but there's nothing I've seen that ties them together directly. I have just started running this module/campaign in 4th edition and was wondering, if anyone else had thought to do the same thing? The alignment issue is one we have had to resolve, but otherwise it all seems reasonable. One thing that I am finding is that all of the Paizo modules are based on smallish, one might even say cramped, maps, which makes the much more versatile 4th ed combat a little hard to take advantage of. Still, cramped is cramped and the players will adapt, I am certain. Is there a thread anywhere, where people are helpign with these 4th edition conversions? it would be great to have some unofficial assistance with this, so the very worthy Paizo modules can be played in the new rule system. What is the appropriate number of players for this adventure? I believe that the assumed number of players for all of the Pathfinder Adventure Paths and Modules is 4, although it should be easy enough to adjust up and down. The Imp vs Psudodragon thing plays a serious background/lore role in the city (fortunately not in the campaign itself). BUT, In such a conflict, the Imps will always triumph. Fast healing, DR 5, and immunity to poison means that a hundred Psudodragons couldn't hope to take out a single Imp. This makes one of the random encounters useless unless you are feeling really cruel to your PCs, fortunately that is the only "real" spot in the campaign where this comes up. See here for an easy solution. When the PCs come out of the Old Fishery, the city has completely gone mad. And the only reason for this is that a young queen most people don´t like sits on the throne now. Wow... when looking into history, there were a lot of young monarchs. Reason enough for a riot and the collapse of the economic system? I don´t think so. After all, the people don´t know anything about the evil nature of Ileosa yet. My table has just embarked on CotCT! Our first session ended with the fishery and the cliffhanger was the city erupting into chaos. I have purchased the Guide to Korvosa. I have my Harrow Deck and Curse of the Crimson Throne Item Cards are on order. We all very excited and can not wait to play through this entire AP! Hi Mitch! Glad you are enjoying Edge so far! Just wrapped this adventure last night (with a few loose ends). My players had a great time. Thanks, Nick! Unfortunately, I wasn't able to work that character into the final dungeon that you told me about at GenCon (DBD), too much squick factor for this group. Starting "Seven Days" in a few weeks! Awwwww...that's okay. Someday, someday, Donkey Baby Daddy will ride again. Question - what # of adventurers are the APs designed for? I've got a group that fluctuates between 4-7, depending on the availability of my gaming group. Any suggestions how I could scale the AP upwards? BTW - love the plot and storyline and everything else about this adventure path. We are running the PFRPG for the first time with my group (all 3.5 devotees) and we are having great success - keep up the great work! We assume 4 players for all the adventures we do—that's the assumption for the baseline in 3.5, and it's an assumption we kept for Pathfinder. 1. How precisely does on get from the top level of the Fishery to the lower level? It's not really clear to me. The door attached to the boat at the back is said to be unknown by the patrons. But the text also claims the alchemist/book keeper will flee to that level if his morale fails, but how precisely does he get to it? 2. Am I right that none of the NPCs would lead a party to the lower level, no matter how skillful the diplomacy? Gaedren's location seems isolated and inaccessible for a reason. I ask because my party seems pretty keen to get to Gaedren without a fight, but I don't easily see a way they can do that. Thanks in advance, I know I am posting on an ancient product, but if there is anyone who might know the answer to these two questions I'd be obliged. No worries about posting on old products! We'll get to them eventually! 1) There's a rickety walkway that runs along the south side of the building—this is area A3. That walkway can be accessed by the door in area A6. The walkway itself leads around the back of the fishery to the old boat (areas A9-A11). You can climb down the stairs in area A10 to the boat's hold in area A11, and there's a secret door in the hull that leads to the lower walkway, area A12. Note that the upper walkway (area A3) is higher than the lower one (A12), and that the lower one is mostly located UNDER the main building, which stands on pilings above the water level. Following the lower walkway (A12) leads you to the lower section of the building. You can also get into the lower section by simply wading or swimming through the water and up into the open area in A13, even though there's sharks and gators. Alternatively, you can jump into the hole in the floor in area A8; that drops into the water next to the walkway at area A12. When the alchemist flees, he does so by ducking through the door in area A6 and running along A3 to the boat back in area A9/A10, where he can drop down the side of the boat and onto the walkway without sneaking though the spider infested hold. 2) Gaedren IS squirreled away, and the fact that his actual den is hidden can certainly make diplomacy a difficult task. I would probably have the PCs, if they can convince the locals to guide them, be led to the spider infested ship if the thugs are secretly trying to harm them still, or barring that, lower them down through the hole in area A8 to the walkway below. 1) I'm using the Pathfinder rules instead of 3.5. This has been easy, and that is saying something because I've never run Pathfinder before. Actually, I've never run 3.5 before either. I haven't run a game of any kind in about six years. I'm finding the experience to be pretty easy, aided by the fact that one of my players has more experience in the system. 2) Here is the really interesting part: I don't know any other RPG players. I'm a working professional in my mid-thirties, and I've only recently moved to my area. Since finding a gaming group would be problematic, I've decided to move my endeavors to a play-by-post format over on thetangledweb.com. I now have a group of five players who span four different countries and a 15 hour time difference. This creates what I've been calling the 24 hour game. I have a PDF copy of EoA, and this has worked out great. I use top-down miniatures available for free online, and I just cut and paste the maps from the module into Photoshop, and paste in the character and NPC tokens. This works great, and doesn't require much in the way of Photoshop knowledge. I imagine that a program like GIMP would also work too. You just have to be able to resize and rotate images. Someone in the reviews section talked about the players wanting to "leave the city like any reasonable person would." I have to completely disagree with this. The background materials for this adventure are outstanding, and if used as intended completely root the PCs in the city. They don't leave when the trouble starts, because they are fighting to defend their home. Korvosa has so much color and flavor to it. All of us fell in love with the city immediately and I doubt I'm going to get any of the players wanting to leave it. Kudos to the designers and their excellent work. I look forward to trying to complete this adventure path in a PbP format. I imagine that is going to take somewhere around a year in real time, so its a lot of entertainment for the dollar. Is there any chance that a tailor-made conversion pdf or guide will be released for CotCT? I like the story but I have trouble running the game because either the conversion rules don't apply well or at all. Other encounters like the jigsaw shark have no basis for conversion as there are no comparable creatures and i don't want to buy the 3.5 monster manual for a few monsters. I just think it would be nice to release a book-by-book conversion guide to make running the game a little easier. I can’t imagine Paizo’s going to do an ‘official’ one; their efforts are focused on future products. If it’s just a matter of converting the monsters, a lot of them have been updated to PFRPG in the various bestiaries and are available through the PRD. If you need stats for specific individuals like Gaedren Lamm or Verik Vancaskerkin, there are also fan-conversions available on-line at d20pfsrd.com - here is the one for this AP. Just for your information, a jigsaw shark is acually a standard Bestiary shark with the young creature template. This information comes from the Inner Sea World Guide. I'm currently running this AP with Pathfinder rules, and I have done a complete conversion for the first two adventures so far, so if you have any questions, feel free to ask. As an example, most NPCs need to be updated with one more class level, so their CRs remain the same, and so on. Thanks to both Zaister and Trace for the help. You have no idea how bothersome it is when a particularly difficult encounter falls flat and the players just look at you like," Was that all?" So does anyone know if Curse of the Crimson Throne and the other OGL books are going to be reworked with the pathfinder rule set and not the 3.5? While I can't remember exactly where I saw it, and therefore can't get you a direct quote, I'm pretty sure I've seen Vic Wertz say multiple times that there are no plans to do this at any point in the near future. Here is a recentish quote from Vic on the issue. As many of you know, one of the biggest issues that lead to TSR's insolvency is the proliferation of campaign settings. When they were actively selling one or two or three campaign settings to their audience, a big chunk of their audience would buy any given book they were releasing. When they were actively selling seven or eight campaign settings, only a small fraction of the audience would buy any given release. A similar problem exists with APs, as the typical gaming group plays only one at a time. Right now, a group looking for an AP might well rule out the 3.5 ones, and the ones that have volumes out of print, so that leaves them 7 APs to consider—or, assuming quality and appeal being similar among them, a 1 in 7 chance they'll buy the current product. If we updated the 3.5 ones, and reprinted the out-of-print volumes, the odd that they'd choose the current release drop to 1 in 12. The simple fact is that we need to sell you what we're making more than we need to sell you what we've made, and allowing things to go out of print is therefore a necessity. And when those out-of-print volumes go for big money on eBay, that's actually helpful in that it helps establish an upward trend for the future value of a present subscription, and underlines the fact that the best time to subscribe to our lines is "as soon as possible."